VCC Analytics — Real-Time Dashboard launches in the Home page. 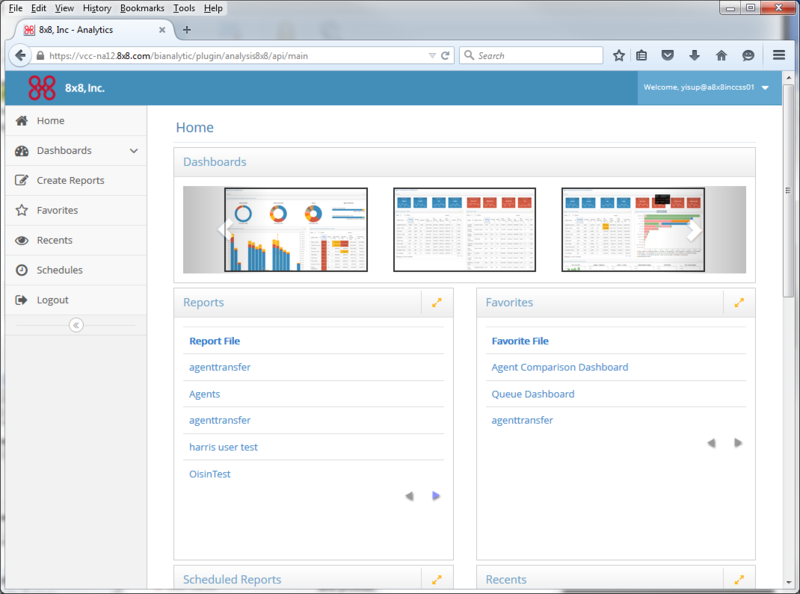 Use the navigation menu on the left to access the desired dashboards and create custom reports. VCC Analytics — Real-Time Dashboard Premier: Offers you the ability to monitor agent productivity and contact center traffic using detailed dashboards. This also offers the ability to create custom reports and schedule them for automatic and periodic generation. VCC Analytics — Real-Time Dashboard Pro: Provides access to historical data using custom reports and standard reports. You have the ability to schedule reports as well. VCC Analytics — Real-Time Dashboard Basic: Offers access to the legacy reporting engine. Note: All bundles for VCC Analytics — Real-Time Dashboard provide access to the legacy reporting engine. Home: View available dashboards, a list of custom reports, and frequently-visited reports. Dashboards: Access dashboards for a quick overview of contact center performance. The dashboards provide a quick snapshot of agent productivity and queue traffic. Create Reports: Create custom reports to extract the desired metrics. Standard Reports: Get quick access to the reports you need most often. Favorites: Bookmark your most-frequented reports as favorites. Recents: Quickly access your most recently-visited reports. Schedules: Schedule reports for automatic and periodic generation and notification. Logout: Log out of VCC Analytics — Real-Time Dashboard.